“The best anti-poverty program around is….” a strong union. | Daniel Katz, Ph.D.
“The best anti-poverty program around is….” a strong union. In his 2010 State of the Union address, President Obama reviewed the legislation his administration had passed as favoring “reform” and “innovation” in our schools, and observed that “In the 21st century, the best anti-poverty program around is a world-class education.” Since that address, we have seen the “reform” and “innovation” that the President was talking about: CCSS, high stakes testing, teacher evaluations tied to those evaluations, charter school expansion. And now former members of the President’s administration are joining corporate reformer Campbell Brown in an effort to sue away teachers’ workplace protections. But is the underlying assumption of the President’s statement that is driving all of these efforts to replace public education as we have known it with an amalgam of public and public-in-name-only schools with teachers who lack strong union protection and who are assessed primarily via student test scores even accurate? Does a “world class education” function as the “best” anti-poverty program or was the President engaging in dangerously simplistic rhetoric that places a burden on primary, secondary and higher education without asking what conditions need to exist in the market for labor? There isn’t a simple answer for this, and there are plenty of competing voices. For example, the Bureau of Labor Statistics estimates that only 27% of the workforce need college degrees for our jobs, and they project only 23% of the labor force will need college or post graduate degrees in 2022. This is disputed by Anthony Carnevale and colleagues at the Georgetown Center for Education and the Workforce, who note that the “college wage premium” has grown 37% since 1976, indicating that employers are currently willing to pay a premium for graduates with post secondary education. Recent data and analysis suggest that college is worth the effort and even the debt in gained economic output over the course of one’s career. The Federal Reserve notes that those with a bachelors degree are likely to earn up to a million dollars more over their lifetime than peers with only a high school education, and even those with associates degrees earn 100s of thousands more. Once cost of money out of pocket for the degree and inflation are considered, that still amounts to an additional 500 thousand. However, these numbers should be read with additional research on the lifetime cost of debt accrued in obtaining the degree which can amount to over 200 thousand dollars in net assets by retirement and which disproportionately effects minority college graduate who take out higher debt loads on average. So is that case closed? Everyone should aspire to college education and secure themselves in the middle class? Not so fast. While a premium exists in wages for college graduates over their peers, that premium has gone up for reasons other than demand for college educated workers. Pew Social Trends demonstrates that one contributing factor in the increased gap is the sharp drop in wages for non college educated citizens even while wages for those with a college degree have remained stagnant when adjusted for inflation. In 2012 dollars, a Millennial with a college degree earns $6600 more than a “Silent Generation” graduate in 1965, but only $730 more than a “Late Boomer” did in 1986. Meanwhile, those Millennials without a college degree earns almost $3400 less today than in 1965. College education, then, is indeed becoming a minimum requirement, but just to keep up at current, stagnant, levels of opportunity and to not fall off the cliff into chronic economic insecurity. And this is where the decline in union representation in the workforce needs to be discussed. It does not appear to be enough to grow a healthy and vibrant middle class simply to say that all middle class aspirants need to attend college, especially when the gap between college and non college income can be at least partially attributed to falling wages. According to a paper from the National Bureau of Economic Research by Emin M. Dinlersoz of the Census Bureau and Jeremy Greenwood of University of Pennsylvania, the decline of organized labor can be attributed to technological innovation that either replaced or outsourced non-skilled jobs that traditionally enjoyed union representation. While there is no doubt that globalization and technology have been highly disruptive forces to organized work forces, it is also insufficient an explanation. To begin with, trade agreements and tax policies that lead to jobs being sent offshore are partially the result of choices made by elected officials as well as the result of innovation. Second, the drop off in labor unionization is distinctly steep in the United States compared with other industrialized economies. If labor’s decline in the United States was solely the result of especially “creative destruction” in the economy and not at least partially the result of choices made by those who influence the economy, our labor decline would be far less steep. Correlation may not be causality, but certain trend lines call our attention to possible causes, and Gordon reports research that notes up to a third of the rise in inequality in the 1980s and 1990s can be attributed to the decline of labor. If we want to address what has been happening to America’s widely stagnating middle class and especially to the cratering lower middle class, we must look at the decline of unions. While labor unions cannot revitalize by organizing jobs that no longer exist, there are credible arguments that even large swaths of the IT sector could benefit from unionization. Which is why the full frontal assault on teachers’ unions since the Great Recession is both disheartening and an existential threat to the remains of the middle class. The NEA and AFT represent more than 4 million unionized teachers, but more than that, their representation provides those teachers with an ability to negotiate openly and fairly for their wages, working conditions and job security. Those negotiations help our children’s teachers maintain a middle class status they might not be able to achieve individually, and the due process rights they obtain from negotiations protect them in a job environment that has inherent political elements and can risk confrontation with the community. Given the mass of new job pressures layered on to the teaching profession since No Child Left Behind and Race to the Top, it is unthinkable that teachers’ collective bargaining rights and job protections should be subject to legislative and legal challenges across the country. But that is exactly what is happening, and it isn’t merely a challenge to teachers’ due process rights — it is aimed directly at one of the largest bodies of unionized middle class professionals left in the country. Where will our Gini coefficient be in ten more years if teaching is no longer a unionized work force? 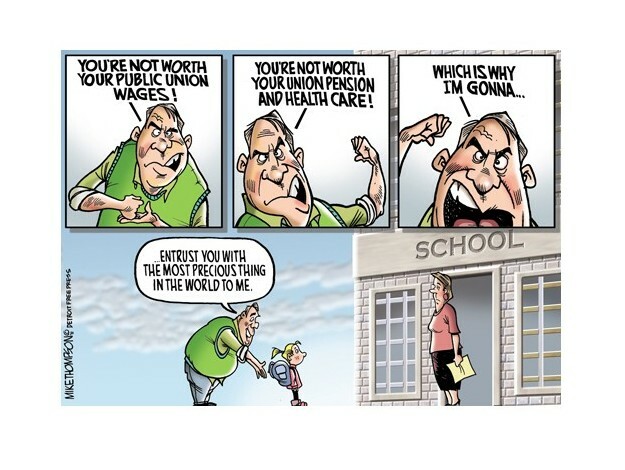 The contradictions of what we demand of teachers and with whom we entrust them and the goals of anti-union “reform” efforts to reduce teachers’ job securities and ability to negotiate fair wages and benefits are manifest. President Obama tasks a “world class education” with reducing poverty in the face of the multitude of social and economic factors that have entrenched poverty in our society. Every parent who sends a child to public school entrusts the teachers of that school with the well being of that child. That breaking the strength of teachers’ collective bargaining rights has appeared as an urgent need to make education better belies are far more malicious intent behind the well financed campaigns of Michelle Rhee and Campbell Brown. Teachers should not be the only ones who take notice — the entire middle class should as well. Pingback: “The best anti-poverty program around is….” a strong union. | Daniel Katz, Ph.D. The cartoon says it all. Interesting Literature had a statistic stating 85% of juvenile delinquents were functionally illiterate. Hmm, there’s an editorial in the making.